The most excellent of deeds on completion of the Hajj or Umrah is to go to Madinah in order to visit the grave of the master of Prophets, the mercy unto mankind, Muhammad ﷺ. Although visiting the Prophet ﷺ is classified as a Sunnah, some scholars have gone to the extent of making it close to Wajib, such is its significance and excellence. Muslims have consistently, from the time of the early righteous Muslim generations, visited him and expended much effort to travel to him because it is from amongst the most important and beneficial acts accepted by Allah. It is an excellent way of attaining spiritual elevation and increasing your love for the Prophet ﷺ.
Whoever visits my grave, my intercession becomes obligatory for him.1Allamah An-Nawawi says, it has been reported by Al- Bazzar and Dar Qutni. Hafiz Ibn Al-Hajar says in Sharh-al-Manasik, it has been reported by Ibn Khuzaymah in his Sahlh. A group of muhaddithin including the likes of Shaykh Abd-al-Haq Al-Ishbili in his Al-Ahkam and Shaykh Taqi-ad-Din As-Subki have classified it as authentic. Mulla Ali Qari has also mentioned in his Sharh-ash-Shifa that a group from the a’immah hadith have classified it as authentic. Whoever visits me after my death is like he who had visited me during my life. And whoever passes away in either of the two Harams, will be resurrected from among the ones given safety on the Day of Resurrection.3Reported by Dar Qutni and Allamah Adh-Dhahabi in Al-Wafa Al-Wafa has taken its chain to be good. The person who performs Hajj then visits my grave after my death, is like he who visited me during my lifetime.4Reported by Dar Qutni, At-Tabrani and Al-Bayhaqi. Whoever undertakes a journey specially to visit me, will be my neighbour on the Day of Judgement. 5Reported by Al-Bayhaqi and it is a mursal hadith. However, Shaykh Taqi-ad-Din As-Subki after elaborating on its different chains of narration has classified it as a good mursal. Whoever performs his Hajj in Makkah, then he comes to Madinah with the sole aim of visiting me in my Masjid, for him shall be written (the rewards of) two accepted Hajj.6Reported by Ad-Daylami as mentioned in Ithaf. And if, when they wronged themselves, they had come to you, [O Muhammad], and asked forgiveness of Allah and the Messenger had asked forgiveness for them, they would have found Allah Accepting of repentance and Merciful. My life is good for you, you do things and things are done for you. When I die, my death shall be good for you, for your works shall be shown to me so that when what I see is good, I shall thank God, but when what I see is evil I shall ask forgiveness for you.7This hadith was transmitted by Bazzar with a sound chain of transmission. Asqalani approved it in his commentary on the compilation of Bukhari, and so did Suyuti in his work on the attributes of the Prophet ﷺ.
Invoke blessings upon me in abundance on Fridays, for it shall be witnessed, the angels witness it. None shall invoke blessings upon me without it being shown to me until he is done. ‘Even after you die?’ asked Abu Darda, to which the Prophet ﷺ replied, Even after death, for God has forbidden the earth to eat the bodies of the Prophets, so that a Prophet of God is alive, receiving his provision.11Ibn Maja, Kitab Md ja fi’l-janaiz, Bab Dhikr wafatih wdafnih salla’llahu ‘alayhi wa sallam, 1627. This is because the guest is visiting that person who hears and sees him, who is aware of his presence, recognises him and answers him. Therefore his visitation is not that of a person presenting himself at his tomb, rather it is that of a visitor being welcomed in the house of the Prophet ﷺ. Between my house and my pulpit is a meadow of paradise. The blessed house of the Prophet ﷺ remains his house, even after his death. It is highly recommended that your intention for this blessed trip should be to visit the Holy Prophet ﷺ. You should also have the intention of drawing closer to Allah through this virtuous action and you should also make the intention of visiting Masjid Nabawi and performing salah therein. After you have made your intention, increase your Salawat upon the Prophet ﷺ. You should do as much Salawat en route to Madinah and recite it with full concentration. As a member of the Prophet’s ﷺ Ummah, you should develop a yearning and desire within yourself to visit him and express your love for him. 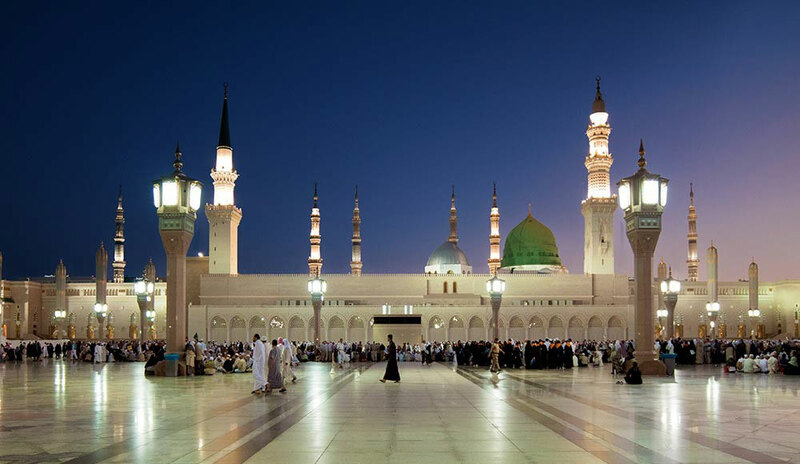 There are many instances of the Sahaba (the companions) and Tabi’een (the successors of the companions) of travelling to Madinah with the sole intention of visiting the resting place of the Prophet ﷺ.
I saw Ibn Umar when he returned from a journey come to the masjid and say, ‘al-salam ‘alaika ya RasulAllah, al-salam ‘ala Abi Bakr, al-Salam ‘ala Abi’ (may the salam be upon you O Prophet of Allah, may the salam be on Abu Bakr, and may the salam be on my father), and then he would pray two units.14Fadl al-Salat ‘ala al-Nabi. When Umar ibn al-Khattab I went to Bayt al-Maqdis (Jerusalem), Ka’b Aahbar I, a senior Jewish scholar, embraced Islam. Umar I was greatly pleased by this and requested him to accompany him to Madinah in order to present himself at the blessed grave of Prophet ﷺ. He accepted this invitation and carried out the request of Umar I. As you begin your journey towards the blessed city of Madinah al-Munawwarah, you should make a special effort to recite Salawat / Durood Sharif (salutations upon the Prophet ﷺ) abundantly, with complete sincerity and presence of heart. The most virtuous act on this blessed journey is the constant recitation of Salawat. As you enter the blessed city limits of Madinah al-Munawwarah you should be completely engrossed in the remembrance of the Prophet ﷺ. Your yearning for the Prophet ﷺ should reach its climax at this point. اَللهُمَّ هَذَا حَرَمُ نَبِيِّكَ فَاجْعَلْهُ وِقَايَةً لِيْ مِنَ النَّارِ وَآمِنَّا مِنْ الْعَذَابِ وَسُوْءِ الْحِسَابِ. Allāhumma hādhā ḥaramu nabiyyika faj’alhu wiqāyatan lī mina n-nāri wa amānan mina l-‘adhābi wa sū’a l-ḥisāb. O Allah, this is the Sacred Precinct of Your Prophet, so make it a protection for me from the Fire and a security from punishment and a bad reckoning. You should keep the sanctity of Madinah in mind and maintain proper adab (etiquette) since Madinah, along with Makkah, is the most auspicious place on the face of the earth. Maintain this sense of reverence from the beginning of your arrival until you depart, with your heart full of awe, and profusely invoke blessings and salutations upon the Prophet ﷺ. Be conscious of the grand status and position of the Prophet ﷺ at all times. If you haven’t done so already, you should bathe immediately after reaching Madinah, wear clean clothes and apply perfume. Adab (Arabic: أدب‎) is commonly translated as “good manners” or “decorum” and refers to the proper etiquette that should be observed by a Muslim. It can be defined as an expression of love from the heart for someone or something. The more love you have for something, the more adab you have for it. Developing adab for the Prophet ﷺ is thus achieved by increasing your love for him. If visiting the blessed Prophet ﷺ after his death is akin to visiting him during his life, then it would be beneficial to learn about the adab of the Sahaba whose characters where chiselled to excellence by the company of the blessed Prophet ﷺ, which imbued them with humanity, selflessness, compassion, humility, integrity and love for Allah. According to Anas ibn Malik I, “None of the Sahaba raised their eyes to look at him except Abu Bakr and Umar. They would look at him and he at them. They would smile at him and he at them.”16Tirmidhi Hadith 3668. In Surah Hujurat, they are told not to raise their voices and not to call the Prophet ﷺ by his name. In Surah Nur, they are told to call out to him softly and with humility. They are also instructed not to leave the gatherings of the Prophet ﷺ without his permission. Do I know his rank and station? Am I aware of what he did for me in the past? Am I aware of what he will do for me on the Day of Judgement? Am I aware of his importance? Am I aware of how much Allah honoured him? Am I aware of his favours upon me? If you’re struggling answer these questions, it is vital that you increase your knowledge of the Prophet ﷺ before your visit. This will enable you to forge a relationship with him and develop a greater attachment to him ﷺ. Prior to your visit, you should also fulfil the adab of the outward (i.e. your appearance). To do so, perform ghusl, wear the best clothes you have, apply perfume, wear white if it’s a Friday, cover your head, let your beard grow and ensure you’re looking your best. This should be done every time you intend to present yourself in front of him ﷺ. 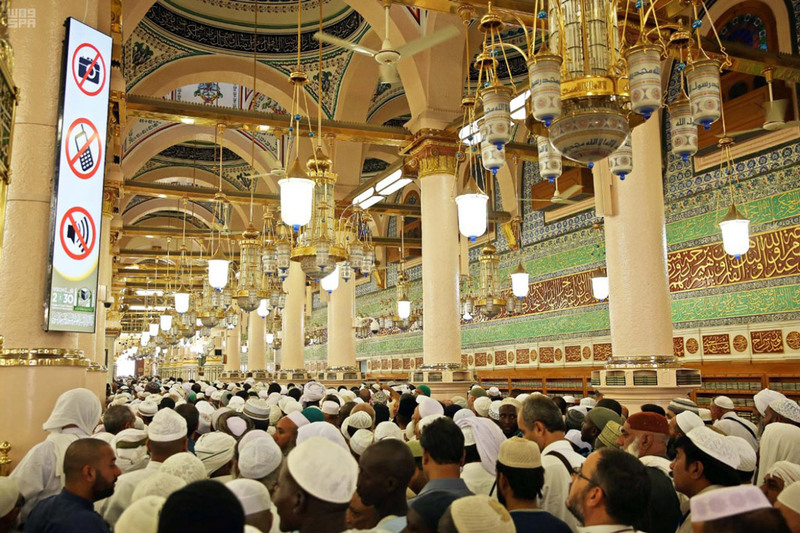 It is Sunnah to perform ghusl before entering Madi­nah al-Munawwarah. If you’re unable to do so, ensure you do ghusl before your visit. Before you make your way to Masjid Nabawi, make sure you’re not distracted by anything that will divide your attention. If you have a pressing matter to attend to, complete it quickly. Don’t indulge yourself in anything else other than the remembrance of the Prophet ﷺ. With great humility, adab and full concentration, proceed to Masjid Nabawi, keeping in mind the sanctity of the blessed city and the reason for your visit at all times. On your way, recite salawat and give some charity to the poor. Take into account that nobody visits the Prophet ﷺ without permission from Allah, who has chosen and selected you from among all of His servants to receive this tremendous honour. Know that you are amongst the most fortunate that Allah has invited you to visit His Beloved, so he ﷺ may honour you. When your eyes fall on the green dome, increase your salawat and know that the best of all creation and the leader of all the Prophets lies beneath this blessed dome. It is preferable for women to visit at night. 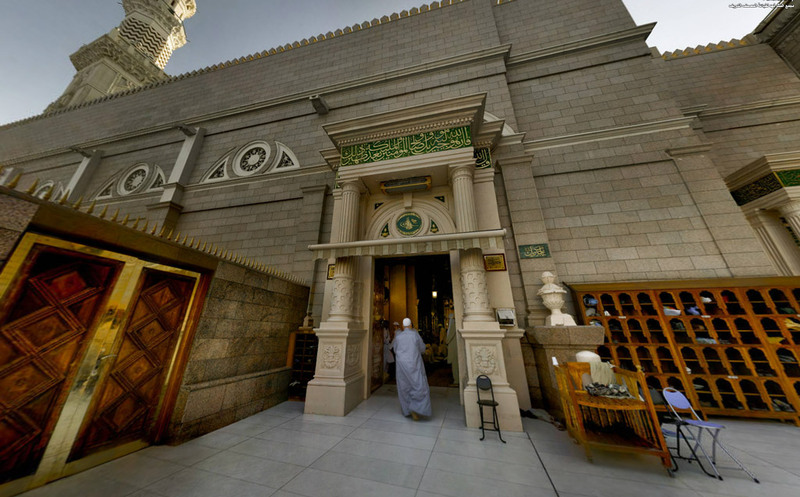 It is preferable to enter Masjid Nabawi from Bab Jibrail (the door through which the archangel Jibril S would come into the presence of the Prophet ﷺ) because it was a habit of the Prophet ﷺ to enter through this door. However, you may enter through any of the other doors. When you arrive the door of the masjid, offer your greetings and wait for a moment before entering – as if you’re asking the permission of the master ﷺ to enter his house. Bismi-llāh, Allāhumma ṣalli alā Muhammad. Allāhumma-ghfir lī wa-ftaḥ lī abwāba raḥmatik. In the name of Allah, send blessings upon Muhammad ﷺ. O Allah, open for me the doors of Your Bounty. After entering the blessed mosque, be extremely mindful. Try not to turn your attention to the beautiful architecture of the mosque. Walk with absolute respect and reverence, with your eyes lowered. Don’t behave with disregard and refrain from raising your voice in the mosque. Try not to converse with others. There are different opinions about the meanings of these sayings. 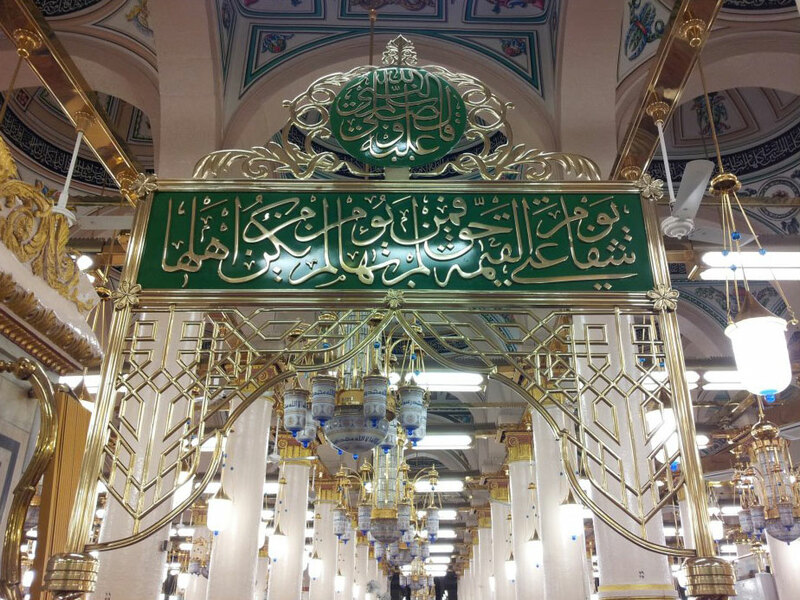 The majority opinion, according to Imam Malik I and many others, is that the Rawdah area is literally from Paradise. At the Rawdah, perform two Rakahs of Tahiyyatul Masjid (prayer of greeting the mosque), providing it isn’t one of the makruh times for prayer. It is preferable to recite Sūrah al-Kāfirūn in the first Rakah and Sūrah al-Ikhlās in the second Rakah. Note: If a congregational prayer is about to begin, partake in it. This will suffice for your Tahiyyatul Masjid prayer. If you cannot get a space here, pray wherever you can, as close as possible to the Rawdah. After the prayer, praise and glorify Allah for the tremendous favour He has bestowed upon you by bringing you to the sacred city as a guest of the Prophet ﷺ. You may also perform two Rakahs Nafl of Salat al-Shukr (prayer of gratitude) to thank Allah for permitting you to complete your pilgrimage and to be in close proximity to the Prophet ﷺ. Make any Dua that you have as this is a place where supplications are accepted. Note: women are only allowed entry to the Rawdah at certain times in the day. After finishing your prayer and dua, make your way out to the southern gallery between Bab al-Salam (the Door of Peace) and Jannatul Baqi. You will be passing before the blessed Prophet ﷺ in just a few minutes to present yourself in front of him. Imam Malik I disliked anyone who said, “I am going to visit the grave of the blessed Prophet ﷺ”, because it implies that the blessed Prophet ﷺ is dead and unhearing, and if a visitor came to the blessed Prophet ﷺ with that state of mind, he would naturally be indifferent to feeling that he was in the presence of the blessed Prophet ﷺ. He didn’t want us to think we were visiting the grave of the blessed Prophet ﷺ but, rather, that we were coming in his presence. Subsequently, we would be inspired with awe and reverence for our Beloved Prophet ﷺ. As you enter Bab al-Salam, be conscious of the fact that you are walking on the ground that has been blessed by the Prophet ﷺ , those pure members of his household, his righteous companions (Sahaba), their followers (Tabi’een), those that followed them (Taba Tabi’een) and the saintly men of God over the centuries. This very ground was blessed by their noble foreheads in prostration day after day. After you enter from Bab al-Salam, look to your right and you will see the names of the blessed Prophet ﷺ shining with light on the Qibla wall, all the way to the Baqi Door. Some of the names of the Prophet ﷺ are inscribed in gold on a purple background: Muhammad, Ahmad, Mahmud, Hamid, Wahid, Ahid. Continue sending prayers and salutations on the Prophet ﷺ until you reach him. Maintain adab and lower you gaze in humility. Show heartfelt shame for all the sins you have committed but remain confident in gaining pardon in the court of the Messenger ﷺ. As you reach the Prophet ﷺ, you will see three gold wire-mesh enclosures, with round holes in each one. Many people are under the impression the Prophet ﷺ is resting inside the first enclosure, with Abu Bakr al-Siddiq I in the second and Umar ibn al-Khattab I in the third. This is incorrect – they are all in the middle enclosure. There are three round holes in the middle enclosure and two holes in each of the two enclosures either side of the middle one. The first hole, the largest and the most prominent, situated on the left hand side of the wire-mesh enclosure directly faces the blessed countenance of the Prophet ﷺ. Moving slightly to the right, the second hole marks the direction of the face of Abu Bakr I and the third hole, the face of Umar I. Stand a few yards away from the enclosure facing the sacred chamber, with your back towards the Qibla, and turn slightly to the left so that your face is directly in front of the blessed face of the Prophet ﷺ. Keep your heart free of all worldly thoughts, and take into consideration that the Prophet’s ﷺ blessed eyes are upon you, he hears you and is aware of your presence. One must adopt maximum humility and respect at this time. This is because Rasulullah’s ﷺ intercession is guaranteed of acceptance. The person who intended to present himself in his court has fulfilled his objective. The person who presents himself at his threshold is never refused. The person who makes du’a through his wasilah (intercession) is certain to have it accepted, and he receives whatever he asks for. Experiences of people and incidents are all testimony to this. The person should therefore show as much respect as possible. It is undoubtedly better to invoke blessings close to the blessed grave than invoking him from a distance because the humility and presence of mind and heart when invoking nearby are not found when invoking from a distance.23Virtues of Invoking Blessings and Virtue on the Noble Prophet ﷺ. You will now offer your salam to the blessed Prophet ﷺ in the best possible manner. There are numerous ways to offer salams. Some scholars have recommended salams containing different themes and words, while others have recommended those salams that are short and concise. Peace be upon you, O Messenger of Allah. When reciting your salam, you must be mindful of the greatness of Rasulullah ﷺ and utter the salam in an average tone. You should not raise your voice loudly as this is extremely disrespectful and demonstrates a lack of adab, nor should you recite your salam too softly. If you can, picture the Prophet ﷺ standing in front of you in your mind’s eye when greeting him. It isn’t compulsory to learn and recite long a salam. If you understand the words and meanings of the salam and feel that your yearning and desire will increase if you were to recite a lengthy salam, then do so. If this is not the case, then instead of repeating a prolonged salam, recite a short salam with absolute yearning, desire, tranquillity and decorum. Ensure the salam you’re sending resonates with your heart and soul. As-‏ṣalātu wa s-salāmu ‘alayka yā rasūla llāh. May the peace and blessings be upon you O Messenger of Allah. ‏Ṣalla llāhu ‘alayka yā rasūla llāh. Blessings be upon you, O Messenger of Allah. As-salāmu ‘alayka ayyuha n-nabiyyu wa raḥmatu llāhi wa barakātuhu. Peace be upon you, O Prophet, and the mercy of Allah and His blessings. Aṣ-ṣalātu wa s-salāmu ‘alayka yā sayyidī yā rasūla llāh. Aṣ-ṣalātu wa s-salāmu ‘alayka yā sayyidī yā ḥabība llāh. Aṣ-ṣalātu wa s-salāmu ‘alayka yā sayyidī yā raḥmatan li-l ‘ālamīn. Wa ‘alā ’ālika wa aṣḥābika yā sayyidī yā noora llāh. Peace and blessings be upon you O my master, O Messenger of Allah. Peace and blessings be upon you O my master, O beloved of Allah. Peace and blessings be upon you O my master, O mercy to the Universe. And upon your family and companions O my master, the light of Allah. السَّلَامُ عَلَيْكَ وَعَلَى آلِكَ وَأَصْحَابِكَ وَأَهْلِ بَيْتِكَ وَعَلَى النَّبِيِّيْنَ وَسَائِرَ الصَّالِحِيْنَ. As-salāmu ‘alayka yā rasūla llāh. As-salāmu ‘alayka yā khyarata llāhi man khalqihi. As-salāmu ‘alayka yā ḥabiba llāh. As-salāmu ‘alayka yā sayyida l-mursalina wa khātama n-nabiyyīn. As-salāmu ‘alayka wa ‘ala ālika wa aṣḥabika wa ahli baytika wa ‘ala an-nabīyyina wa sā’ira ṣ-ṣaliḥin. Ashhadu annaka balaghta r-risāla wa addayta l-amāna wa naṣaḥta l-ummah. Jazāka llāhu ‘anna ‘afḍala ma jaza rasūlan ‘an ummatihi. Peace be upon you O choicest creation of Allah. Peace be upon you, O beloved of Allah. Peace be upon you, O leader of all messengers, seal of the prophets. Peace be upon you, upon your family, upon your companions, upon your wives, upon all the Prophets and all pious people. I bear witness that you have conveyed the message, fulfilled the trust and advised the people with the best of advice. May Allah reward you on our behalf, the best reward he would grant a messenger. Recite Salat al-Ibrahimiyyah / Durood Ibrahim; the salutation that is recited during Salah in the sitting position. Testify to the oneness of Allah and the finality of His messenger ﷺ by repeating the Shahada. Most importantly, ask the Prophet ﷺ for his intercession. One of the great favours that Allah has granted his beloved Prophet ﷺ is that he will be a means (wasilah) of intercession (shafa’a) for his community on the Day of Judgement. The Prophet ﷺ is also a means of gaining proximity to Allah in this world. It is vital that you make dua and plead for the Prophet’s ﷺ intercession when presenting yourself to him. You may recite the dua below or supplicate in your native language. Yā rasūla llāh as’aluka ash-shafā’ata wa atawassalu bika ila llāhi ‘an ‘amūta Musliman ‘ala millatika wa sunnatik. O Rasulullah! I request your intercession, and I ask Allah, through you, to enable me to die on your religion and your Sunnah. Intercede for me and assist me in this world and in the Hereafter, Ya Rasulallah! Resurrect me with you and allow me to be with you on the Day of Judgement, Ya Rasulallah! Allow me to drink the water of al-Kawthar from your beautiful hands on that day, Ya Rasulallah! Please don’t let me be embarrassed or ashamed on the day, Ya Rasulallah! Ya Rasulallah! I have come to you in a state of sin. Please intercede for me so that I may be forgiven. Forgive me and be pleased with me. Please permit me to follow you into Jannah Ya Rasulallah – that Jannah where I may be close to you! Allow me to see you in a dream, Ya Rasulallah! For you said: ‘Whoever sees me in a dream, has truly seen me.’ I yearn to see your beautiful face! Ya Rasulallah, please allow me to see you in a state of wakefulness! Ya Rasulallah, your enemies were privileged to see your blessed face. I am not your enemy, but your servant. Please allow me to see the one I love! Increase my love for you, Ya Rasulallah! Increase my proximity to you, Ya Rasulallah! Be my means of obtaining closeness to Allah. Allow me to send more Salawat upon you, Ya Rasulallah! Please allow me to adopt more of your Sunnahs , Ya Rasulallah! Ya Rasulallah, let me serve you and serve your community. Ya Rasulallah, please guide me through all my affairs! Ya Rasulallah, please help me with my ailments; whether they are physical, mental or spiritual. Indeed, you are the Bringer of Relief, the Merciful, the Kind! Ya Rasullallah, please raise my rank. Indeed, you are the Raiser of Ranks! Remember to also seek his intercession for your parents, family, teachers, friends and the Muslim community. Be careful if you choose to open your hands in dua when facing the Prophet ﷺ. Although this is acceptable according to Islamic law, you may be reprimanded by the Saudi authorities for doing so. The Saudis follow the Salafi school of thought, a movement which significantly differs to that of traditional Sunni Islam. As-salāmu ‘alayka yā rasūla llāh min fulān ibni (binti) fulān. Peace be upon you O Messenger of Allah from ……, son (daughter) of ……. Replace fulān ibni (binti) fulān in the above sentence with the name of the person followed by the name of the invidual’s father, e.g. As-salāmu ‘alayka yā rasūla llāh min Zayd ibni Ahmad (male) or As-salāmu ‘alayka yā rasūla llāh min Zaynab binti Ahmad (female). As-salāmu ‘alayka yā rasūla llāh min jamī‘i man ’awṣanī bi s-salām. Peace be upon you O Messenger of Allah. May peace be on you for all those who requested me to convey salam. If you’re struggling with the Arabic, it’s acceptable to convey their greetings in your native language. As-salāmu ‘alayka yā Abā Bakr. Peace be upon you, O Abu Bakr. Assalāmu ‘alayka yā khalīfata l-muslimīna Abā Bakri aṣ-Ṣiddīq. Peace be upon you O Caliph of the Muslims, Abu Bakr al-Siddiq. As-salāmu ‘alayka yā Abā Bakrin ‏ṣafiyya rasūli llāhi wa thānīhi fi l-ghār. Jazāka llāhu ‘an ummati Muḥammadin khayra. Peace be upon you, O Abu Bakr, close friend of the Prophet, second of two in the cave. May Allah reward you well on behalf of the Ummah of Muhammad. As-salāmu ‘alayka yā khalīfata rasūli llāh. As-salāmu ‘alayka yā ‏ṣaḥiba rasūli llāhi fi l-ghāri Abā Bakrin aṣ-Ṣiddīq wa raḥmatu llāhi wa barakātuhu. Peace be upon you O Caliph of Rasulullah. Peace be upon you O companion of Rasulullah in the cave, Abu Bakr Siddiq. You may praise Abu Bakr I, thank him and make dua, using him as a Wasilah as you did with the Prophet ﷺ. Peace be upon you, O Umar. As-salāmu ‘alayka yā amīra l-mu’minīn, ‘Umara bni l-Kha‏ṭṭāb. Peace be upon you O Commander of the Faithful, Umar ibn al-Khattab. Peace be upon you O Umar. Allah gave honour to Islam through you. As-salāmu ‘alyka yā amīra l-mu’minīn. As-salāmu ‘alyka yā ‘izza l-Islāmi wa l-Muslimīn. Wa raḥmatu llāhi wa barakātuhu. Peace be upon you O leader of the faithful. And the mercy of Allah and His blessings. You may praise Umar I, thank him and make dua, using him as a Wasilah as you did with the Prophet ﷺ.
As-salāmu ‘alaykumā yā ḍajī‘aī rasūli llāhi wa rafīqayhi wa wazīrayhi. Wa jazākuma llāhu aḥsana l-jazā. Peace be upon you o resters next to Rasulullah, his two companions and ministers. And May Allah reward the two of you an excellent reward. You should praise them, show your gratitude to them and use them as a Wasilah for your duas. Remember to send them the salam of others if you were asked. You may then take another step to the left so that you’re once again facing the Prophet ﷺ where you can make more dua. It is the belief of traditional Sunni Islam that you can supplicate to Allah through various means or intermediaries. In Arabic, an intermediary is known as a ‘Wasilah’ and the act of using an intermediary is known as ‘Tawassul’. The practice of using the righteous servants of Allah as a means of gaining proximity to Him or to ask for His help is documented in Hadith literature as well as by Muslims through the ages. The foremost intermediary for Muslims is the Prophet ﷺ. Unfortunately, this hugely beneficial and widely practiced act of worship is today sometimes erroneously regarded as associating partners with Allah. Following are some proofs for the legitimacy of this practice. Allāhumma innī as’aluka wa atawajjahu ilayka bi nabīyyika Muḥammadin ‏ṣallā llāhu ‘alayhi wa sallama nabiyya r-raḥma. Yā Muḥammad(u) innī atawajjahu bika ila rabbī fī ḥājatī liyaqḍī lī. O Allah! I ask You and I turn to You using Your Prophet, the Prophet of mercy as an intermediary. O Muhammad! I turn to my Lord by means of you for my need, that He fulfils it. O Allah! Accept his intercession in my favour.24Tirmidhi, vol. 5 p.388, hadith: 3578. Ibn Majah, vol. 1 p. 441, hadith: 1385. Through the virtue of the Prophet’s ﷺ supplication, the blind man’s vision was restored. It is recommended to read this dua after greeting the Prophet ﷺ.
As-salāmu ‘alayka yā rasūl llāh, sami‘tu llāha yaqūlu “wa law annahum idh ‏‏ẓalamu anfusahum jā’uka fa s-taghfaru llāha wa s-taghfara lahumu r-rasūlu lawajadu llāha tawwāban raḥīma” wa qad ji’tuka mustaghfiran min dhanbī mustashfi’an bika ila rabbī. And I have come to You repenting from my sins and seeking your intercession to my Lord. Fīhi l-‘afāfu wa fīhi l-jūdu wa l-karam. Its (that is, the grave’s) fragrance has scented all the land and mountains. May my life be sacrificed for the grave of which you are the occupant. In it there is purity, generosity and nobility. The Bedouin then left and I fell asleep. In my dream I saw the Prophet ﷺ who said to me, ‘O ‘Atabi! Convey to that bedouin the glad tidings that Allah, the Exalted One, has forgiven his sins.”25Tafsir Ibn Kathir, vol. 1. p 519 (commentary of chapter 4, verse 64) al-Adhkar al-Nawawi: p. 336. O Allah! Let me die in a state of Iman following the Sunnah in the city of Madinah and allow me to be buried in Jannatul Baqi. Do not waste any time during your stay in Madinah and spend as much time as you can in Masjid Nabawi. Some choose to spend their entire stay in Madinah in close proximity to the Prophet ﷺ. Spend time your time in the mosque performing Salah, reciting Quran and sending Salawat upon the Prophet ﷺ. Whenever you pass the tomb of the Prophet ﷺ, whether from inside or outside Masjid Nabawi, stop and offer salam before continuing. When your gaze falls on to the Green Dome, whether you’re close to the mosque or far away, look at it with love and yearning and send salutations upon the Prophet ﷺ. Try to offer salam at the blessed grave of the Prophet ﷺ as much as you can. Imam Abu Hanifa, Imam Shafi’i and Imam Ahmad X all recommended visiting the blessed grave as much as possible. Imam Malik V didn’t recommend visiting it excessively due the risk of becoming disinterested and taking it for granted. Don’t turn your back towards the blessed grave, regardless of whether or not you’re performing Salah, unless you have no other option. Don’t circumambulate around the blessed tomb or prostrate towards it. 1. ↑ Allamah An-Nawawi says, it has been reported by Al- Bazzar and Dar Qutni. Hafiz Ibn Al-Hajar says in Sharh-al-Manasik, it has been reported by Ibn Khuzaymah in his Sahlh. A group of muhaddithin including the likes of Shaykh Abd-al-Haq Al-Ishbili in his Al-Ahkam and Shaykh Taqi-ad-Din As-Subki have classified it as authentic. Mulla Ali Qari has also mentioned in his Sharh-ash-Shifa that a group from the a’immah hadith have classified it as authentic. 3. ↑ Reported by Dar Qutni and Allamah Adh-Dhahabi in Al-Wafa Al-Wafa has taken its chain to be good. 4. ↑ Reported by Dar Qutni, At-Tabrani and Al-Bayhaqi. 5. ↑ Reported by Al-Bayhaqi and it is a mursal hadith. However, Shaykh Taqi-ad-Din As-Subki after elaborating on its different chains of narration has classified it as a good mursal. 6. ↑ Reported by Ad-Daylami as mentioned in Ithaf. 7. ↑ This hadith was transmitted by Bazzar with a sound chain of transmission. Asqalani approved it in his commentary on the compilation of Bukhari, and so did Suyuti in his work on the attributes of the Prophet ﷺ. 11. ↑ Ibn Maja, Kitab Md ja fi’l-janaiz, Bab Dhikr wafatih wdafnih salla’llahu ‘alayhi wa sallam, 1627. 23. ↑ Virtues of Invoking Blessings and Virtue on the Noble Prophet ﷺ. 24. ↑ Tirmidhi, vol. 5 p.388, hadith: 3578. Ibn Majah, vol. 1 p. 441, hadith: 1385. 25. ↑ Tafsir Ibn Kathir, vol. 1. p 519 (commentary of chapter 4, verse 64) al-Adhkar al-Nawawi: p. 336. 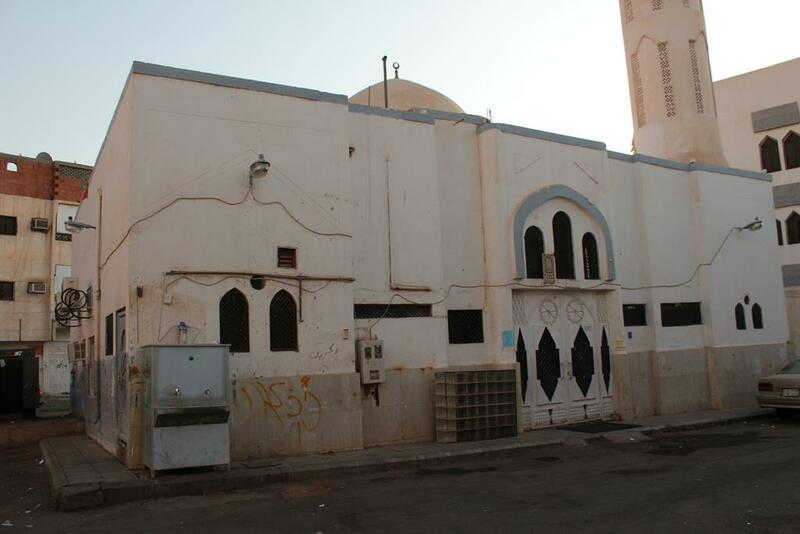 The Palace of Urwah ibn al-Zubayr (Arabic: قصر عروة بن الزبير) is located on the banks of Wadi al-Aqeeq in the west of Madinah. It was built towards the end of the first century AH.